Header Text – This is the title of your multimedia file. Use File From – You can upload your multimedia file either from your computer or from a different server. To upload your file from your computer, you can click on Browse to open the file from your computer. 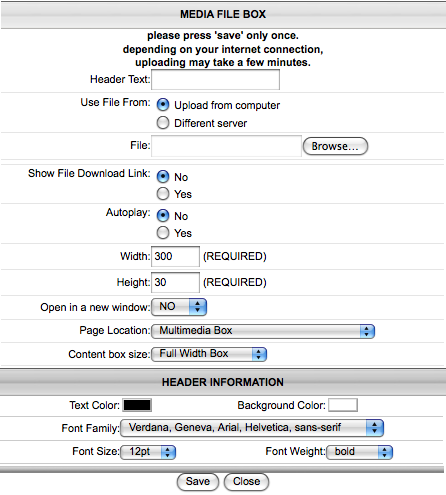 To upload your file from a different server, you can enter the website address in the File box. Show File Download Link – This enables visitors to download the multimedia file to their computer. This creates a link under the multimedia file that visitors can right click on to download the file. Autoplay – This will enable the multimedia file to automatically begin playing when someone visits the page. Width - This is the width of the multimedia file. If you are uploading audio, this is the width of the play bar. If you are uploading video, you will need to update this to the original width of the video. Height - This is the height of the multimedia file. If you are uploading audio, this is the height of the play bar. If you are uploading video, you will need to update this to the original height of the video. Open in a new window - Instead of playing the multimedia file directly on the page, you can enable it to play in a new window. This will create a link on the page that opens up the multimedia file in a new window.